When most people are presented with the question ‘Windows or Mac’, a lot of people would say a benefit of having a Mac is that they supposedly don’t suffer with virus’s and attacks for they are more secure than Windows – until now. Sophos, a developer of security software with headquarters in UK and USA developed a free anti-virus for Mac OS-X. Upon releasing the free software to ‘protect’ Mac users from fatalities such as virus’s and trojan’s, released some pretty interesting figures that give indication that Mac users should take not of. Cult of Mac reported that the data was collected from 50,000 malware reports generated by 150,000 users of Sophos anti-virus for Mac in the first two weeks on November 2010. 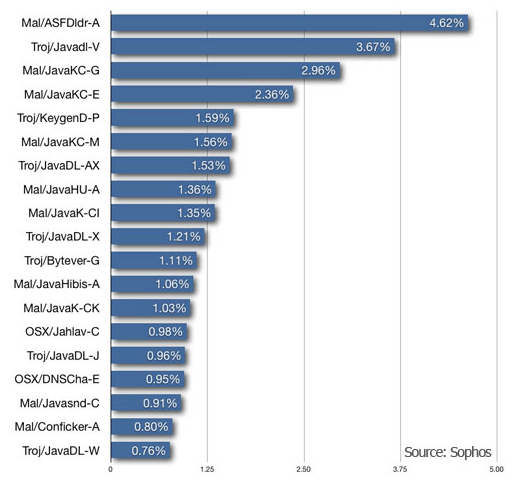 The figure below, which shows what types of Malware, Trojans and more were found on Mac users computers at first glance look quite ugly. Now obviously most of these Malware pieces of software cannot be executed on the Mac platform as it’s not designed for it – it’s made for … Windows. In worst case scenario, it will just take up a few megabytes of storage on your hard drive but in the case you are running boot camp – be careful. According to Sophos, out of all the Malware which is included in the graph, only a few of them were actually designed for Mac but it goes in principle that all users despite operating systems should take precautions with online browsing, downloading and what information is stored on their hard drive. If you want to download Sophos’ free protection software, you can download it from their website. For more information, call us on 0117 933 0570 or fill in our contact form and we’ll get back to you.